Bret graduated with a Bachelors degree from Northeast Missouri State University where he studied percussion with Dan Petersen. He was a member of the Disney World All-American Band in 1980 and then in 1981 became a member of the Cavaliers Drum and Bugle Corps. When first moving to Chicago, Bret was a freelance drum-set artist and has performed with Rich Matteson, Bobby Shew, Gloria Estefan and Nexus. Bret began teaching the World Champion Cavaliers Drum and Bugle Corps in 1984 and served as Caption Head as well as Percussion Arranger through 2005. During this tenure, they won 6 World Championships and 5 High Percussion Awards. In 2005, after retiring from the Cavaliers, he joined the Bluecoats Drum and Bugle Corps as a design and percussion consultant. In 2010, he served as Program Coordinator for the Colts Drum and Bugle Corps. He is currently consulting with Phantom Regiment Drum and Bugle Corps. Bret is the Percussion Coordinator for the Prospect High School music program from Mt. Prospect, Illinois. He is also a consultant for various high schools around the country including LD Bell High School from Hurst, Texas. Bret has also taught the Oklahoma State Centennial Band who performed in the 2007 Tournament of Roses Parade in Pasadena, California. He is an active Percussion Arranger/Clinician for various colleges and High Schools both across the nation and abroad. These include Northern Illinois University and Arizona State University. Bret consulted and worked with the Texas State Indoor Percussion ensemble from San Marcos, Texas who competed at the 2006 PASIC Convention. Bret arranges for two of the top marching groups in Japan. One is Aimachi from Nagoya, Japan who were the 2006 Champion’s at the All Japan Championships. The other group, Vivace, is a semi-professional all girl marching band from Tokyo, Japan. He was also a guest performer and composed an original percussion ensemble entitled “Renegade Highway” for the Plano East High School who performed at a Showcase Concert at the 2006 Percussive Arts International Convention held in Austin, Texas. Bret has written articles for publication in Percussive Notes Magazine and currently serves on the Board of Directors for PAS. As a clinician, Bret has traveled extensively across the United States, Japan and Europe presenting clinics for Yamaha, Zildjian, Remo and Innovative Percussion. 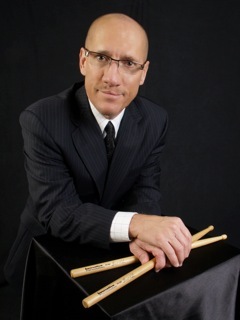 If you wish to contact Bret regarding clinics, arranging or commissioning a percussion ensemble go to www.bretkuhnmusic.com or email him at bretkuhnmusic@sbcglobal.net. Bret Kuhn dives into the design and intended purpose behind his two signature field series snare sticks, the FS-BK and FS-BK2 Velocity!